The Department of Labor (DOL) is coming. DOL employer audits are on the rise and the best time for you to analyze whether you are ready or not for a Department of Labor audit is now, before they come knocking on your door. Broad Reach Benefits provides oversight to make sure your organization is prepared for a DOL audit and understands what is required to stay in compliance to avoid unnecessary penalties and fines. Request a copy of our free Audit Guide to get an overview of why certain health plans are selected for audit, what you can do to reduce the risk of being audited and what you need to do to if the DOL comes knocking on your door. An audit by the DOL can be one of the most stressful things that an employer will go through. The DOL has broad authority to investigate an employee benefit plan’s compliance with various federal laws, including the Affordable Care Act (ACA). Partly because of all the new requirements under the ACA, health plan audits are unfortunately on the rise. Being selected for a DOL audit can have serious consequences for an employer, including penalties or other corrective action, not to mention the time, effort and stress involved in the audit process. To make the process as painless as possible, and maybe even avoid an audit, we have our DOL Audit Guide. Participant complaints to the DOL about potential ERISA violations. In 2013, according to a DOL audit summary, 775 new investigations were opened as a result of participant complaints. Answers on the plan’s Form 5500. For example, if a plan’s Form 5500 is incomplete, or if inconsistent information is reported from year to year, the DOL may investigate the issue further. The DOL’s national enforcement priorities or projects, which target the DOL’s resources on certain issues. For example, the DOL’s Health Benefits Security Project focuses on making sure health plans and health insurance issuers comply with the ACA’s mandates. A quality employee benefits broker will ensure that your health plans comply with all applicable federal laws. Remember that you always need to maintain plan documents in order to be on compliance. The resources and sample documents in the Guide can help employers understand and conduct their own internal compliance audit so they can be prepared if the DOL decides to conduct one as well. 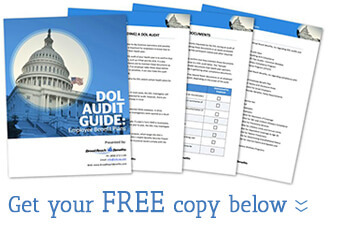 Receive a FREE copy of our DOL Audit Guide Now. Simply complete the form below to receive your copy via email.